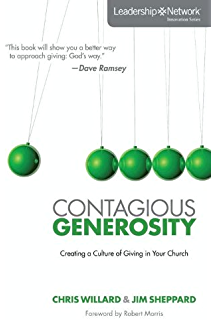 Contagious Generosity highlights the best practices gleaned from real-life church leadership situations and shows how church leaders can effectively cultivate a culture of generous giving in the local church. A growing number of leaders are beginning to discover that there are key factors that make some churches thrive with abundant resources while others struggle with shrinking budgets. It’s generosity that’s contagious. It explains why some churches are experiencing unexplainable ministry growth and unprecedented church funding … even in the midst of tough economic times. Quote: “A church must be intentional about developing a culture of generosity from the outset, because the culture of the church is the most powerful way of effecting corporate change. If a church isn’t clear about what it believes on the topic of giving and stewardship, then its members won’t be either. The culture of a church includes its customs and its underlying attitudes” (29). Quote: “There is no status quo in a church culture; a church is either moving toward or moving away from becoming a generous church. Either you are leading your people toward a lifestyle of biblical generosity, or you are watching them drift toward selfishness and the world’s economy. A generous church culture must be constantly, intentionally influenced until it results in the contagious generosity of the congregation” (33). Note: Knowing the culture of a community, especially a faith community, can help to make ascertains about how people will respond in/to certain situations. Note: What we believe determines how we act—Mission and vision statements are important for churches to have but they are only of great value when there is a culture to support it. Quote: “The key to a successful strategy is simple: establish a plan and then execute it. We tend to talk about our plan. We may pray about our plan, and that is essential. Bat at some point, we must establish specific, measurable steps, appoint the person who will lead the charge, and make it happen. Strategy leads to specific action steps that make a difference. Good intentions, on the other hand, lead to passivity. We satisfy our own need to feel good about ourselves, but good intentions lead to no quantifiable impact on the world” (44-45). Quote: “Only after we’ve established a common level of knowledge and given a consistent call to action so that this knowledge is applied can we begin to expect transformation to occur. However, we must be aware that we cannot control the process of transformation… Authentic transformation will never be safe. It will always cost us something, but because we know that God is good and is in control, we know that it will make an eternal difference” (55). Note: Having and implementing a thought through plan aids in churches having abundant resources. Note: Generosity is transformative and impacts each and every part of a church and its ministry. Quote: “Churches that practice a contagious level of generosity don’t see or acknowledge limits. They begin with a foundational belief that we serve an all-powerful, all-knowing, and always-present God who creates resources when they don’t exist. Contagious giving is rooted in faith, and it remains open to the impossible” (62). Quote: “In the same way that God freely gave of himself, with no expectation of anything in return, churches should also be willing and eager to freely give to people in need. Time after time, we have seen the grace of God lived out in this way” (65). Note: Your budget (personal and church) depicts your true core values. Note: Finances need to be discussed from the pulpit and the church leaders and pastors should be the first to exhibit and exude generosity and giving. Quote: “(1) it’s okay to be uncomfortable talking about money, and (2) it’s not okay to let that discomfort become an excuse for failing to disciple your people in this area” (79-80). Quote: “Because Jesus carefully and regularly revisited the conversation about the relationship between our faith and our money, pastors should do so as well. We find that many pastors assume that their congregations already know what the Bible says about money… The assumption that church members know everything that the pastor thinks they should can cause confusion or lead to frustration. Wrong assumptions about where people are at in their journey toward generosity can end up eroding people’s willingness to be generous and limit how open they are to following their pastor in this area” (86-87). Note: Generous churches have generous pastors—their influence and impact on congregations are great. Note: Views pertaining to generosity need to be based in Scripture and pastors should teach and model this truth in their own lives and in the church. Quote: “If a church and its leaders want to create a culture of generosity, the pastors must not shy away from preaching on matters of financial generosity” (94). Quote: “The goal of our salvation is a generous life, and regardless of the text you preach, you can call your congregation to generosity by presenting them with the message of God’s love and his gracious, generous work on our behalf” (103). Note: A key step in establishing a culture of generosity is building trust with the congregation, which means being transparent with them about money and church budget issues. Note: One issue that pastors run into is that they only bring up matters of money when the church needs funds, but this trains people to tune out the message of God’s generosity. Instead, the topic of money and generosity should be a common theme in sermons. Quote: “Learning to embrace the ministry of asking is one of the keys to experiencing the abundance that God promises his people when they obediently follow him” (109). Quote: “Most pastors fail at asking for financial gifts because they have not spent any or enough time with the person they are asking. They fail to cultivate a relationship” (113). Note: Pastors should encourage members to give where they are passionate and feel God leading them, whether it is in support of the church or an outside ministry. Note: It is most important to have faith that the God we serve is a God of abundance, and that He can provide all of the resources we need if we boldly ask for it. Quote: “Because of their apparent success, we tend to assume that high-capacity people don’t need a lot of attention from the church. We forget that they to need o be disciple and guided in their growth as Christ followers. Even thought they have been successful in certain endeavors, they have all the same problems as other families in the church” (123). Quote: “High capacity givers know they have a unique opportunity to make a difference with the resources at their disposal. They likely already have some idea of what they’d like to do, but they also have some questions and need direction. […] We are simply providing them with the tools, advice, and opportunity to make an informed decision about how they want to steward God’s resources” (126). Note: Wealthy people in the church are often overlooked in the church population, but would often be willing to give generously if the church makes the first step. Note: Financially blessed people seek investments for the future and are not afraid to fail in their endeavors; however, they do like to see that the failures have produced growth. Quote: “Changes in giving patterns almost always represent an opportunity for ministry, and we believe it is critical that churches use the power that comes from tracking giving to observe these changes and uncover these opportunities” (137-138). Quote: “Obviously, no church member expects a dividend check for their investment in a particular church ministry. But they do expect to hear that their investment has accomplished something that they can’t do on their own, something that affirms the things they are deeply passionate about” (140). Note: This chapter put a large emphasis on the pastor looking at how much people give and noting any changes in giving. The reasoning is that the way a person stewards the finances God has blessed them with tells more about a person’s spiritual growth than any other factor. Note: It is important to measure overall giving of the church to better understand the state of the church. Quote: “What you choose to celebrate most often in your church will eventually become what is most valued by your church. Celebrating generosity in the life of your congregation reminds people that God is transforming hearts, minds, and lives through the investment of their resources” (154). Quote: “In most churches today, the offering has become so habitual that the leaders no longer give much thought to it. Though they may not say so, they are demonstrating that the offering is not as spiritually important as the music, the sermon, and the time of prayer” (157). Note: It is important to thank members for their giving; creating a habit of giving thanks helps them feel appreciated and helps new members feel connected. Note: Report significant giving to the church – they will be excited to hear about the work their community has been able to accomplish! Quote: “When we act in ways that are consistent with our commitment to Christ, a watching world notices. We cannot hide who we really are, and generosity reveals that our faith is genuine and true” (168). Quote: “The goal of giving generously is the spiritual formation of people so they are prepared and mobilized for ministry” (173). Note: Many people outside of the church will give generously if they see that the money is used to make a real impact. Note: It is not possible to fake generosity; people will be drawn to the church when they see that the church is giving with no expectation of repayment.